Can you keep a secret? Ok, good! This girl, my oldest daughter Abby, is off to HIGHSCHOOL next week and I am having a very hard time accepting that my firstborn has grown up way too fast! I have to say though, I have been very lucky so far during her teen years. She has only gave me the silent treatment a handful of times. Abby is a pretty laid back girl which makes shopping for back to school a breeze. Much like her mama, she loves to be comfy – a hoodie and sweats are this girls best friend. I’m going to admit that I am a total slacker. It is the Friday before school starts and I am still not done our back to school shopping. We went out last weekend to grab the essential new back to school shoes but the long list of supplies is still floating around my messy work desk. If you are like me and still have back to school shopping to do don’t fret. While back to school shopping can be financially stressful for so many families, Giant Tiger is literally your knight in shinning armor. They are your one-stop shop for all things back to school. From your littles that will be off to school for the very first time to your teens entering high school and even the not-so-little ones heading off to college. Giant Tiger is going to send all of them back to school in style while keeping our parental budget in check! Aside from their affordable and stylish fashion Giant Tiger also has a great selection of backpacks, lunch bags, binders and more to get your kids back to school ready! Abby loves to be comfy. 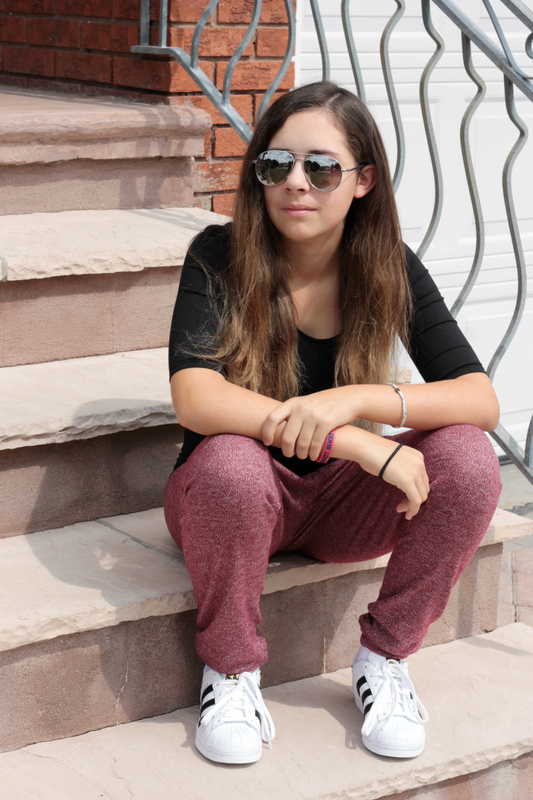 She’s always been one for the simple life and these mySTYLE women’s loose knit pants are the perfect comfy pant for her to wear to school. They are light enough to wear in the warmer temperatures yet warm enough for those cool fall mornings ahead. The matching mySTYLE women’s loose knit popover hoodies are perfect for those mornings that are not cool enough for a jacket. Who am I kidding, what teen wears a jacket right? Even in the winter I feel like I am fighting a losing battle trying to get her to wear a coat. They also have amazing mySTYLE women’s nubby v-neck tees that are so super soft and only $7. At that price I she can have one of every style they have. They are perfect for laying under a flannel long sleeve in the fall or a nice chunky sweater. 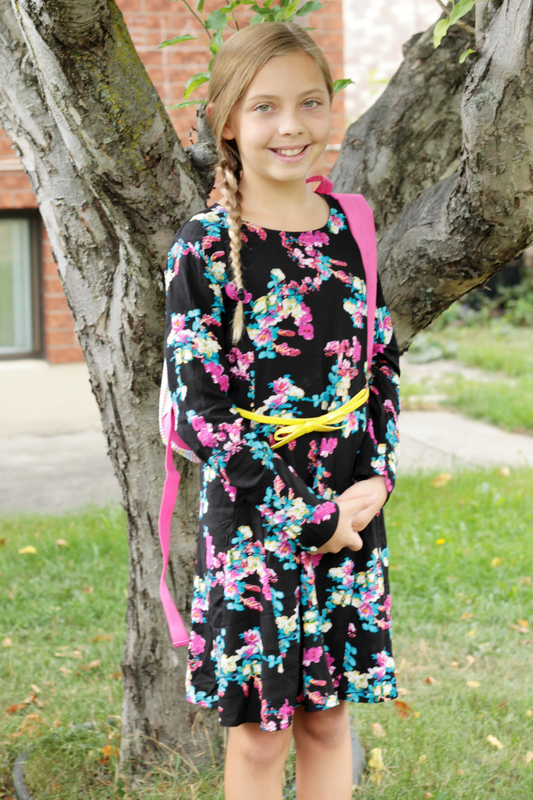 Giant Tiger recently introduced 3 new children’s clothing lines just in time for back to school. Not only are all three super fun and fashionable which the kids will love, they are also super affordable and durable which us parents appreciate. While Bella is not yet attending school the Monkey Bars line outfits our little boys and girls from sizes 2 through 6x. It is a brand that is made to withstand our energetic and sometimes rough kids. Hailee loves all things fashion and the new Bella & Birdie line has not let her inner diva down. It is creative, cool and confident clothing for your girls in sizes 7 through 14. For as long as I can remember Hailee has always loved dresses. Even in the dead of winter this child would fight me to wear a dress to school. When she laid eyes on the Bella & Birdie dress that Giant Tiger sent her she was in love. It is perfect on its own or even when paired with a solid legging for those cool fall days. The pattern is bright and fun which totally suits Hailee. I am a mom of three girls but I am also an Aunt to two nephews. 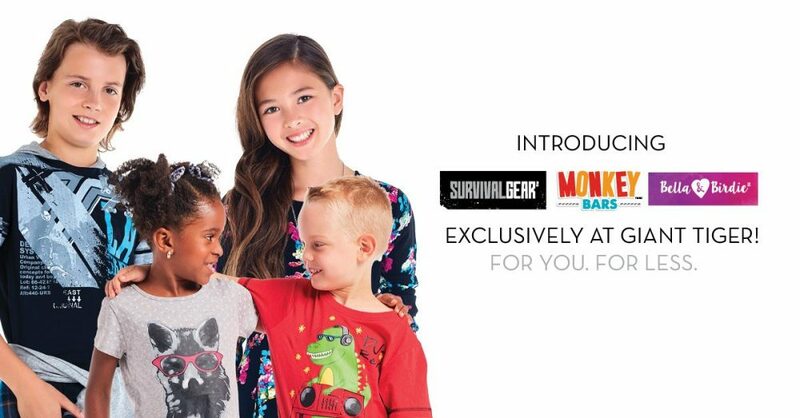 Giant Tiger’s new Survival Gear line is fun, fearless, and for adventure clothing for your boys in sizes 8 through 16. Last time I was in my local Giant Tiger I was totally checking out the cool stuff for my nephew Chase. Giant Tiger recently introduced their new Happiness Guarantee, this is one thing that significantly influences where I shop for my kids. If a store stands behind their product and are willing to replace or refund it creates a risk-free shopping experiences which gives me peace of mind. With Giant Tiger’s new Happiness Guarantee, if your child has outgrown, outlasted or simply changed their mind, simply return the item with your receipt for a FULL REFUND. Wondering what the time limit is to return? Well there is none, one week, three months, if you are not happy just bring it back! How’s that for standing behind a product? Stay up-to-date with the latest from Giant Tiger! Follow Giant Tiger on Facebook, Twitter, and Instagram. Enter below on the giveaway widget for your chance to win a $50 Giant Tiger gift card. The giveaway ends on September 11, 2016 at 11:59 PM EST. Disclosure: Although this post has been sponsored by Giant Tiger, the opinions and language are all my own, and in no way do they reflect Giant Tiger. Any product claim, statistic, quote or other representation about a product or service should be verified with the manufacturer, company, provider or party in question. My favourite school memory was staying in the same school for more than one year. We were a military family and moved lots! I always looked forward to seeing all my friends that I didn’t see over the summer. Meeting my lifelong friend on my first ride on a school bus in grade 5! Thank you! I loved seeing all my friends after summer break! My favourite memory was getting to see my friends again!! I always loved back to school shopping. My favorite memory was definitely seeing all my friends again after the summer holiday was over. My favourite back to school memory is just shopping for new cloths and them feeling so good wearing them to school. My favourite back to school memories was shopping for new clothes! I always loved shopping for back to school! I loved back to school shopping with my Mom and seeing my friends that I hadn’t seen all summer! My favourite back to school memory is also my worst! It’s my favourite as I was back at the same school with my friends instead of moving from being a Navy family. It’s my worst as it was my first time using a city bus and I lost my change for the fare. My favourite back to school memory is my mother taking a picture of me holding a sparkly star I made on my first day of kindergarten. Thank you for the giveaway! My favourite memory was my friends and art class, that was my fave all through school!! 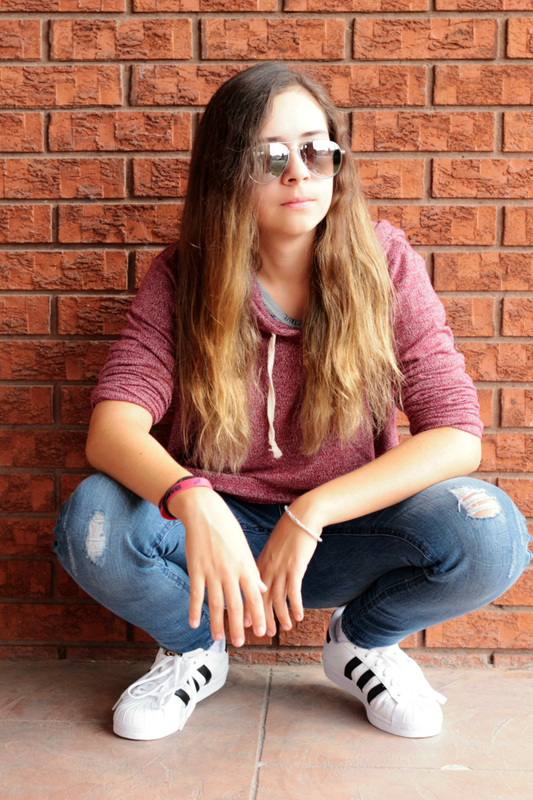 My daughter also starts Grade 9. She would LOVE Jose shoes! I remember seeing all my friends again after the Summer. It was great! I don’t really have a favourite back to school memory of my own, but my favourite back to school memory is of my oldest daughter when she moved on from preschool to kindergarten. On the walk to school, she skipped up the street way ahead of me the whole time, so excited to start full time school. I wanted to take some first day of “big school” photos, and she obliged, but she was like “Mom, I just want to get to school!” And then when we finally got there she gave me the quickest hug and kiss and ran into the school, so excited to be there. Here I was worrying about her moving on from part time preschool to full day school, and she was more than ready. It really made my heart happy! Every year since she has been just as eager to go back to school, I just love it. It makes me happy dropping her off somewhere that I know she wants to be. I always got a new pair of shoes for back to school, such an indulgence cause we had six of us going back to school. My friend change school to attend my school. My favourite back to school Memory was being so excited to see who my teacher was! My favourite back to school memories have been the ones I’ve made with my kids, their excitement and pushing through their fears to go line up and join their class. Looking forward to new memories next week. My favorite was when I started High school. I was so nervous, scared but, I met many friends on the first day.. this was so awesome because they are still my friends today..
My favourite memory of back to school was going shopping for new supplies. I also loved seeing my friends again and meeting my new teacher! My favourite back to school memory was always getting new school supplies and new clothes. It was always a happy time of the year. My best back to school memory is of meeting up with the group I walked to school with the first day back and catching up with the ones I hadn’t seen over the summer. My favorite back to school memory is going to the fair then being able to wear the jewelry we won to school the next day. My favourite back to school memory was wearing a new outfit that I desperately wanted and seeing all my friends that I’d been missing and checking to see if we had the same teacher again. My favorite school memory was always being so excited to see my friends again! Thinking back my fave back to school memory would be the year our school made its first mascot and I was chosen an the costume was made exactly to fit me and anyone since has had to been able to fit it . That was the best year I was so happy about that I could do my gymnastics in the costume as well it was really fun. My favourite back to school memory was going shopping and getting new clothes and school supplies. My favorite memory was getting new shoes to go back to school. We had canvas sneakers in the summertime that wore out quickly in the bottoms and we use to put cardboard in them to make them last. My favorite memory was wearing this brand new pink & black plaid dress on the first day of school in grade 3, it was so pretty & I was so excited to show it off. I had begged my mom to buy it & I was so proud to wear it. And now that I’m an adult, anything plaid is my favorite & now my daughter loves it too! My favourite memory was wearing a new dress my Mom made for the first day of school. 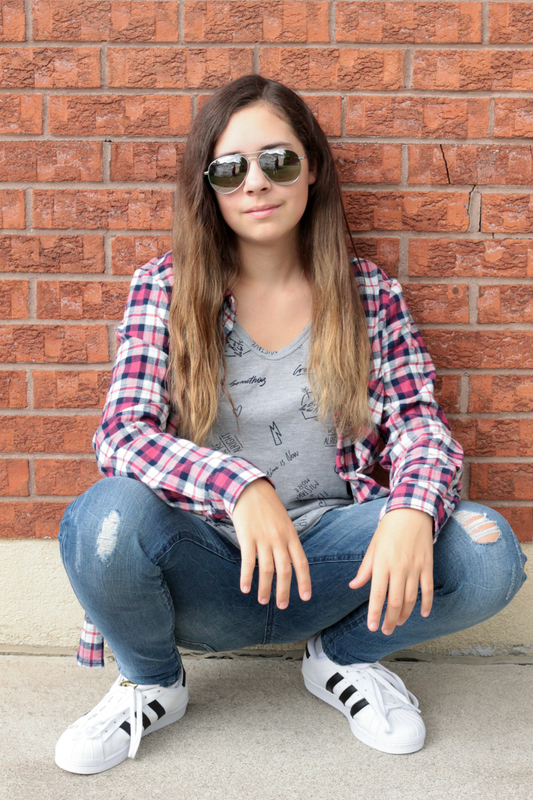 Favourite back to school memory is going shopping for clothes & school supplies at the Eaton center. I used to love being able to meet back up with all my friends every year! My favorite back to school memory was going through flyers with my mom for school supplies before we shopped. I loved getting on the bus and seeing the familiar and new faces. My favourite memory is going back to school shopping with my siblings and parents. HANDS UP MY FAV MEMORY IS BACK TO SCHOOL SHOPPING! I remember my son wearing his fire hat the first day of school. good thing it wasn’t pajamas. My favourite memory was walking home through the snow on snow days! Been trying to go back to school for a whole and I just Won tuition to a program so that is my new fave memory. I remember my first day of school and getting on the bus…I felt so grown up! my favorite thing about B2S every year was picking out a first day outfit! WEARING NEW CLOTHES AND SHOES ON THE FIRST DAY! My favorite memory is school supply shopping with my mom. The day was always fun and special. My favourite memory is meeting several people who I stayed friends with. Many great memories of several of us hanging out at a friends house. My favorite memory was going to school for grade 3 and I thought my best friend had changed schools. It turns out she didn’t and was in my class for the year! I love this post! I never think of going to Giant Tiger where I live!! some clothes for high school. It was a fun day that I enjoyed with him very much. My son started kindergarten this year, he was so excited! It was my favorite Back to school for sure! My favourite back to school memory is travelling back from school and noticing a new girl from my class. She was walking in the same direction I was going in so I joined her in the walk and found out that she lived in one of the new homes that had been built on my street. 50 years later we are still in contact with each other.